Kalena had a birthday which, of course, means cake. 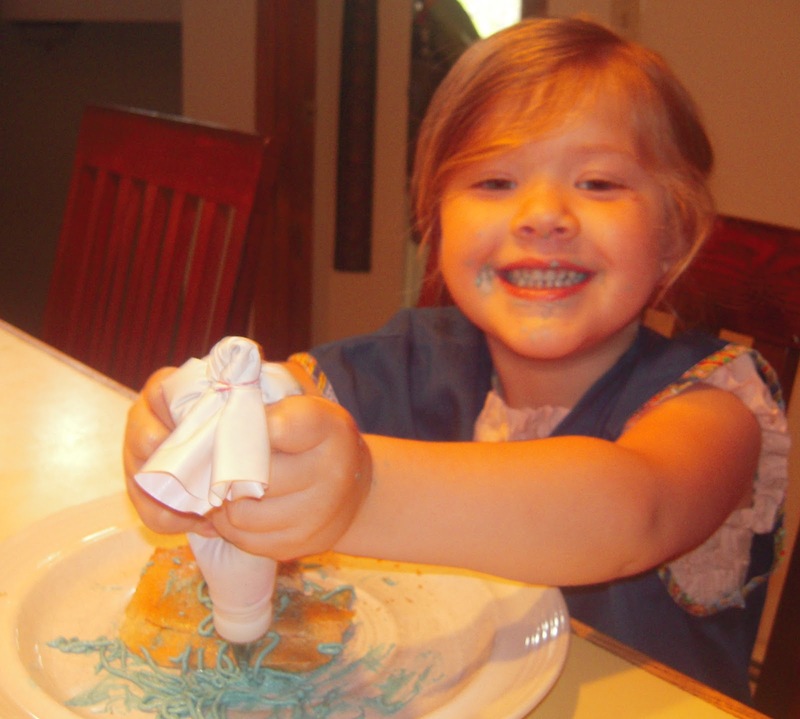 I decorated her cake on Friday and thought I’d let the kids have a little fun with the leftover frosting. I intended to let them frost graham crackers (because that’s yummy) but we didn’t have any. Nor did we have any sugar cookies, animal crackers, or anything else that would have been remotely good to eat frosting on. So they frosted bread. Will was quite pleased with his results and kept telling me, “Made ‘nake!” (That’s “snake” for those of you who don’t speak toddler.) Also, he was totally indifferent to the bread. 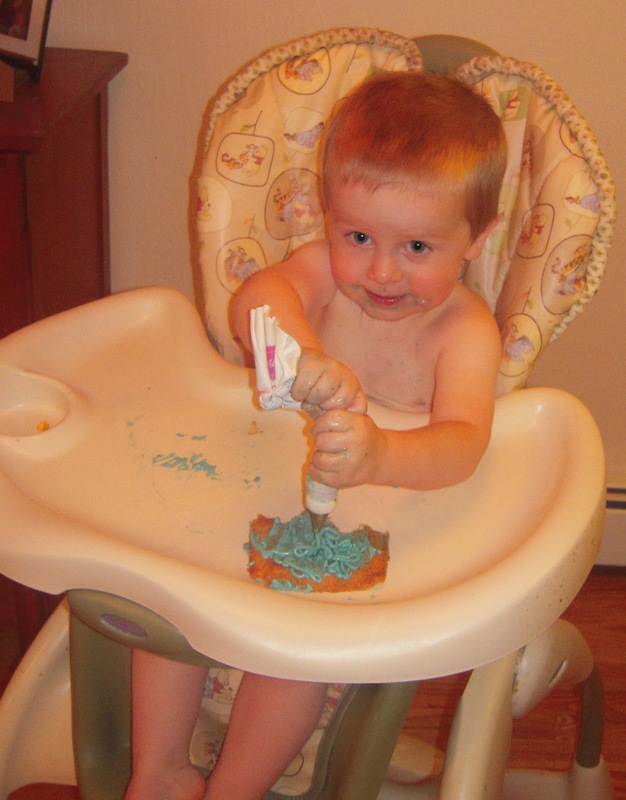 He just scraped the frosting off to eat it, and I suspect he would have done the same no matter what he was frosting. Kalena was also please and indifferent to the bread. 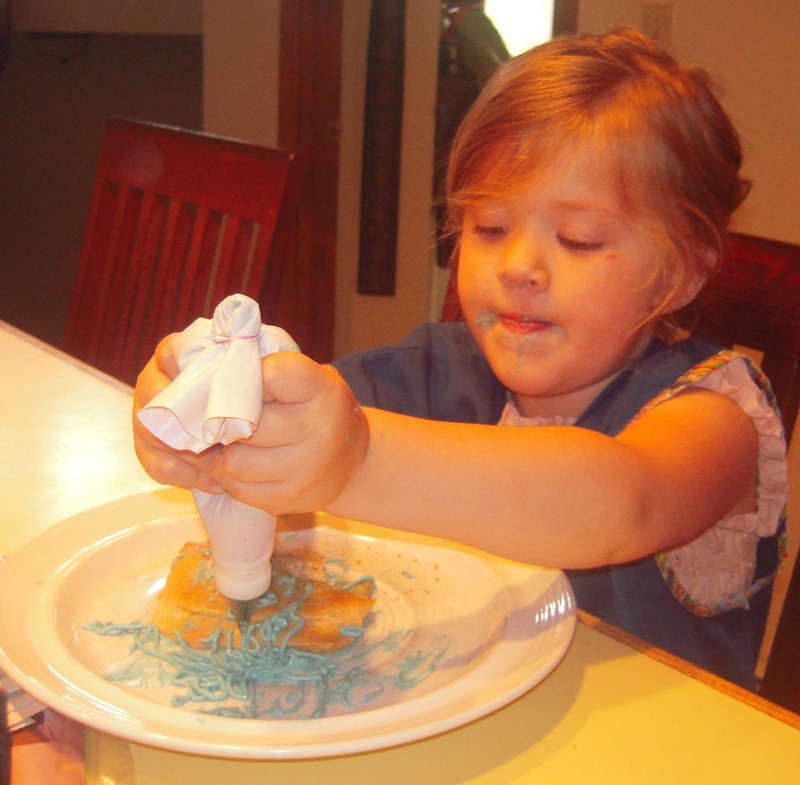 She was a big fan of “drawing” with the frosting. 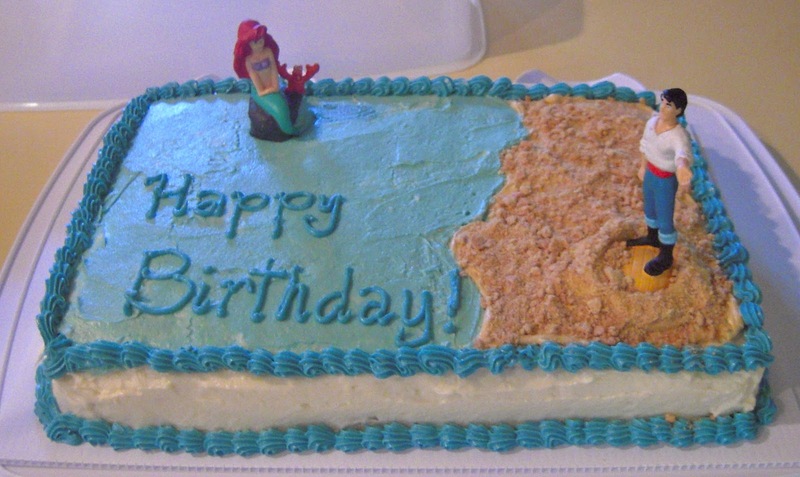 An Ariel cake, as per Kalena’s request. (Alright, I may have nudged her in that direction because we already had the figurines.) And that’s graham cracker “sand” on there, which is why I didn’t have any for the kids to frost. OH WELL. Very cute- kids AND cake. 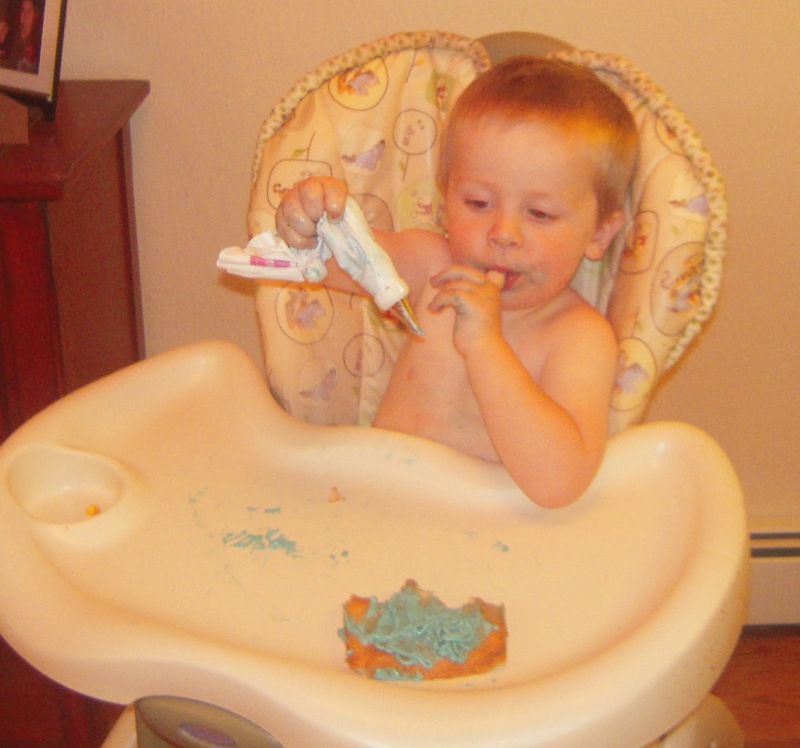 I think if I gave Amelia a bag of frosting she'd be hyper for a week! Looks like a fun activity though, and GREAT JOB on the cake! Super cute. The cake turned out great! I am very impressed. Wow, I'm impressed with the cake! I tried decorating cookies at Christmas and they came out looking more like Kalena's bread.Also, when I first read Will's comment I thought he was trying to say he made (frosted bread while) naked. Because he looks naked and I wasn't paying attention to where the apostrophe was. I am not sure if you could come up with a more fun activity for little kids to do. A mess to make that you can EAT?